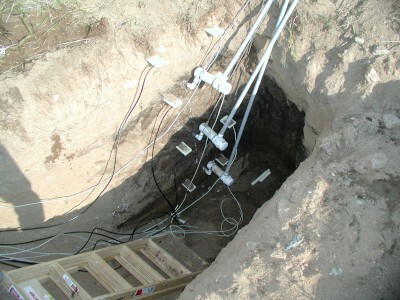 Unsaturated-zone instruments used to estimate ground-water recharge are installed in oil-saturated soils at the Bemidji, Minnesota, research site. U.S. Geological Survey (USGS) scientists have discovered that rainwater recharging the water table above petroleum contamination plumes affects how plumes grow and the rate that petroleum products (in this case crude oil) degrade and weather in ground water. The amount of recharge affects the migration of oil in the subsurface, how chemicals dissolve from the oil into ground water, and the transport of nutrients and other dissolved constituents that control the natural attenuation of contaminants to the water table. USGS scientists working at the Bemidji Crude Oil Spill Research Site have developed a method for estimating ground-water recharge amounts. The method quantifies the soil moisture balance by continuous monitoring of soil moisture content. Applying the new method at the site, the scientists found that the estimated recharge rate under depressions on the land surface is about double the rate in areas where the land surface is just a few feet higher in elevation. They have documented that the variation in recharge results in highly variable rates of crude oil degradation in the subsurface oil body. Faster oil degradation rates occur under areas where there is increased recharge because there is a corresponding increase in the transport of the nutrients and other dissolved chemicals the microbes need for metabolism and growth. The extreme variation in degradation rates calls into question a widely used method for dating the timing of an oil spill that's based on an assumption of relatively consistent degradation throughout a contamination site. The new method and the information on variable degradation rates can be used by remediation professionals to more accurately document the degradation of petroleum contaminant plumes for sites where monitored natural attenuation is the cleanup remedy of choice. USGS scientists inoculating microbial growth media to determine the number and type of microorganisms carrying out biodegradation in the contaminated aquifer. Delin, G.N., and Herkelrath, W.N., 2005, Use of soil moisture probes to estimate ground water recharge at an oil spill site, Journal of the American Water Resources Association, v. 41, no. 6, p. 1259-1277.